Start at the end of Camino El Huinganal Street, La Dehesa. Enter in Establo el Huingal, cross the wood fence near the horses. Follow the principal singletrack en the ground. Cross 3 little creek. The path is always smooth climb. The end is \"La Buitrera\". A flat area with a group of stones like little pyramid. Return in the same path. Review: A previous reviewer stated you return on the same single track you climbed up. This is not entirely true. 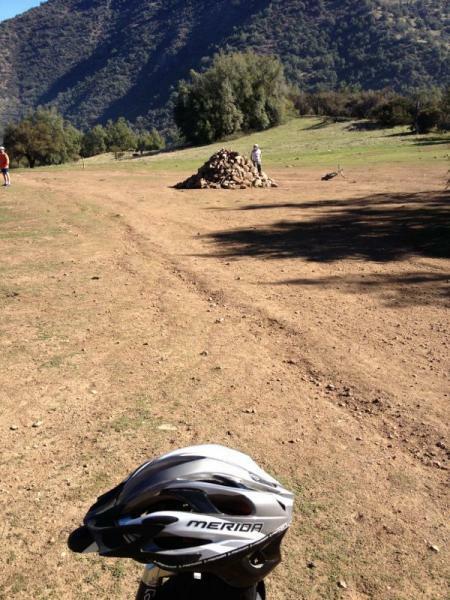 There is at least 2 very good flowing DH options to return to the trail head. Review: Plenty of uphill, lots of single track to explore which generally all end up at the same place. Review: Good ride. The long uphill climb is definately worth the fast ride down. There is no flow to the riders on the hill, so when you are going downhill be prepared to dodhe other rider. El Huinganal MTB Trail 4.25 out of 5 based on 4 ratings. 4 user reviews.